Is this the end for The Boss 'n' Hug Connection? The 2019 WWE Superstar Shakeup is history and has ended up completely changing the landscape of WWE. A long string of WWE Superstars switched brands and several NXT Superstars made their way up to the main roster. The Superstar Shakeup has a history of building up new alliances. On the other hand, it sometimes results in the breakup of a tag team. The WWE Universe might remember the time when The Miz and John Morrison broke up during the 2009 Superstar Shakeup, exactly a decade ago. The split turned Morrison into one of the biggest babyfaces on the blue brand. The Miz benefitted the most from the breakup and went on to become the WWE Champion on Monday nights. Let's take a look back at five teams that were broken up in this year's Superstar Shakeup. Kairi Sane has moved to SmackDown Live. At NXT TakeOver: War Games 2018, Kairi Sane faced off against Shayna Baszler in a "2 Out Of 3 Falls" match for the NXT Women's Title. Sane ended up losing the bout, thanks to interference by Shayna's allies, Jessamyn Duke and Marina Shafir. 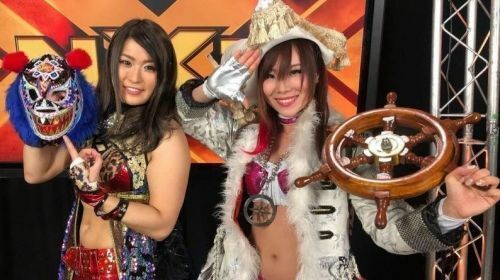 This resulted in Sane aligning with her best friend Io Shirai, forming The Sky Pirates. The duo went on to become a popular tag team down in NXT, but the association didn't last long, as tonight, Kairi Sane switched brands and became a part of SmackDown Live. Paige had promised last week that she was going to bring in a tag team, which turned out to be Kairi Sane teaming up with former SmackDown Women's Champion, Asuka. Paige made another promise this week and stated that the duo is guaranteed to become the Women's Tag Team Champions in the near future. The IIconics currently hold the coveted belts. Hopefully, Shirai gets to realign with her former tag team partner somewhere down the line, when she gets called up on the main roster. Who should move over to Raw during the 2019 Superstar Shakeup? WWE News: WWE Superstar speaks up for Sasha Banks, praises "The Legit Boss"